Welcome to Red Bank Battleﬁeld Park! 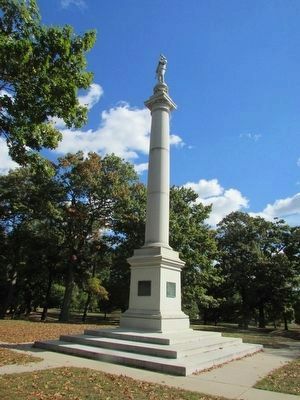 Red Bank Battlefield Park is a 44-acre park administered by Gloucester County’s Department of Parks and Recreation. Enjoy our scenic walking trails, beautiful views of the Delaware River, and tours of The Whitall House and Red Bank Battlefield. 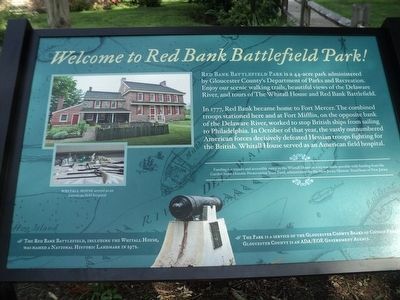 In 1777, Red Bank became home to Fort Mercer. The combined troops stationed here and at Fort Mifflin, on the opposite bank of the Delaware River, worked to stop British ships from sailing to Philadelphia. In October of that year, the vastly outnumbered American forces decisively defeated Hessian troops fighting for the British. Whitall House served as an American field hospital. 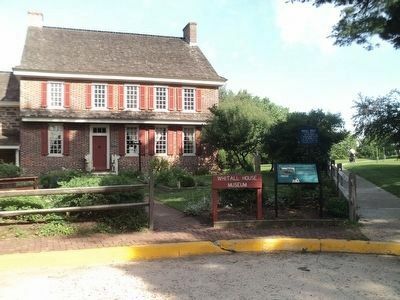 The Red Bank Battlefield, including the Whitall House, was named a National Historic Landmark in 1972. Erected 2015 by New Jersey Historical Commission. Location. 39° 52.169′ N, 75° 11.425′ W. Marker is in National Park, New Jersey, in Gloucester County. Marker is on Hessian Road, on the right when traveling west. Touch for map. Marker is on the Red Bank Battlefield. Marker is in this post office area: National Park NJ 08063, United States of America. Touch for directions. are within walking distance of this marker. Ann Cooper Whitall (here, next to this marker); Whitall House (a few steps from this marker); The Medicinal Garden (a few steps from this marker); James and Ann Whitall House (a few steps from this marker); Operations on the Delaware (within shouting distance of this marker); The Aftermath (within shouting distance of this marker); National Park Armed Service Monument (within shouting distance of this marker); Welcome to Red Bank Battlefield (within shouting distance of this marker). Touch for a list and map of all markers in National Park. More about this marker. 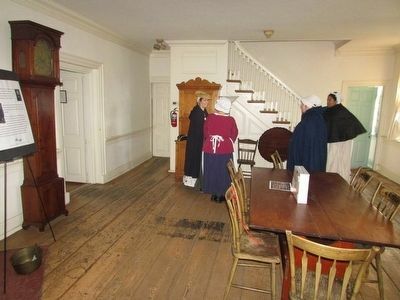 Photographs of the exterior and interior of the Whitall House appear at the upper left of the marker. The Whitall House can be seen behind the marker. 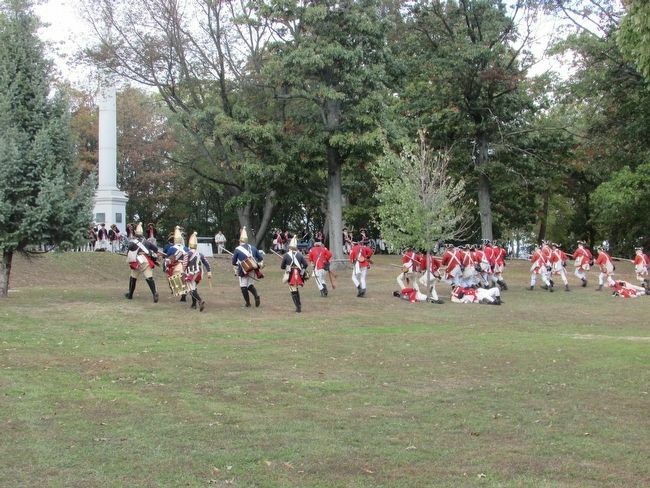 British and Hessian troops charge the Americans on the Red Bank Battlefield. More. 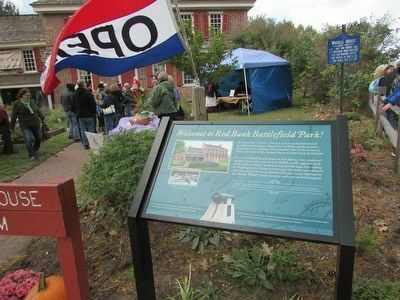 Search the internet for Welcome to Red Bank Battlefield Park!. Credits. This page was last revised on June 16, 2016. This page originally submitted on October 19, 2015, by Bill Coughlin of North Arlington, New Jersey. This page has been viewed 167 times since then and 6 times this year. Photos: 1, 2, 3, 4, 5, 6. submitted on October 19, 2015, by Bill Coughlin of North Arlington, New Jersey.